Be prepared to be yelled at. No, they're not mad; they're happy to see you. That's how they say hello here. As soon as you enter, everyone who works at Gatten--whether they're in the middle of wrapping a ball of rice in nori, cutting cucumbers, or clearing a table--will look up and acknowledge your presence with an enthusiastic "Irasshaimase!" And since the restaurant attracts a lot of customers with its $2-$3 per plate sushi, be prepared to hear the salutation at least a half-dozen times during your meal. And oh, when someone leaves, they'll also bid farewell with the same amount of energy. With this and the plucky koto soundtrack they've got on a constant loop, Gatten is as lively, noisy, and busy a sushi purveyor as you'll ever encounter. And because this is another one of those conveyor belt sushi mills (which makes three for Irvine), turnover is what you want. As I've said before, this is sushi as food, not as art. Everything is in constant motion. Interesting things, tasty things, things you wouldn't think to order will whiz by on the sushi Shinkansen. This is the kind of restaurant where Travel Host Andrew Zimmern's credo of "if it looks good, eat it" can be applied. 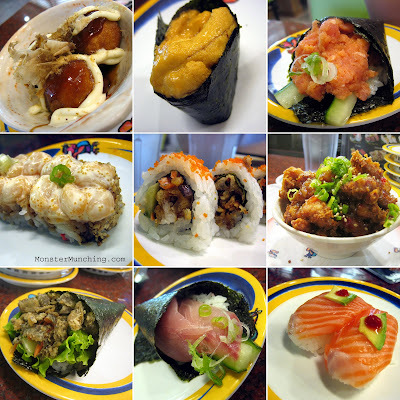 I had a sweet piece of scallop butterflied and sprawled over a morsel of rice; a decent uni gunkan maki; and excellent chicken karaage (that I actually ordered from our waitress to ensure it was fresh out of the fryer). There was a steam-emitting balls of takoyaki zig-zagged with mayo and sauce just waiting to inflict a first-degree burn on your tongue. Everything else I had in the three separate visits seems to blur, flavors and texture merging. 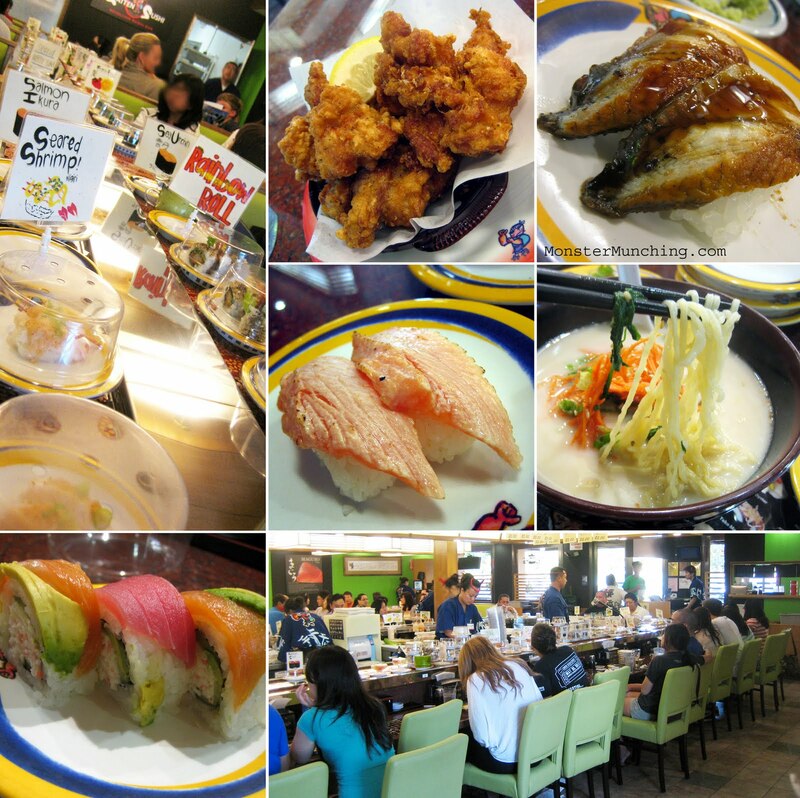 All I know is I enjoyed myself more here than I did at Irvine's other two kaiten sushi joints; and I did it without spending more than $12 before I got full. Every visit, I ordered the salmon skin hand roll. One out of those three times, it wasn't great; the skin was chewy as leather. But the other two times, the deep-fried curls of the sea chicharrón was immaculate and crunchy enough that it drowned out any and all ambient noise...which is saying a lot here. I'm so glad you did this place! 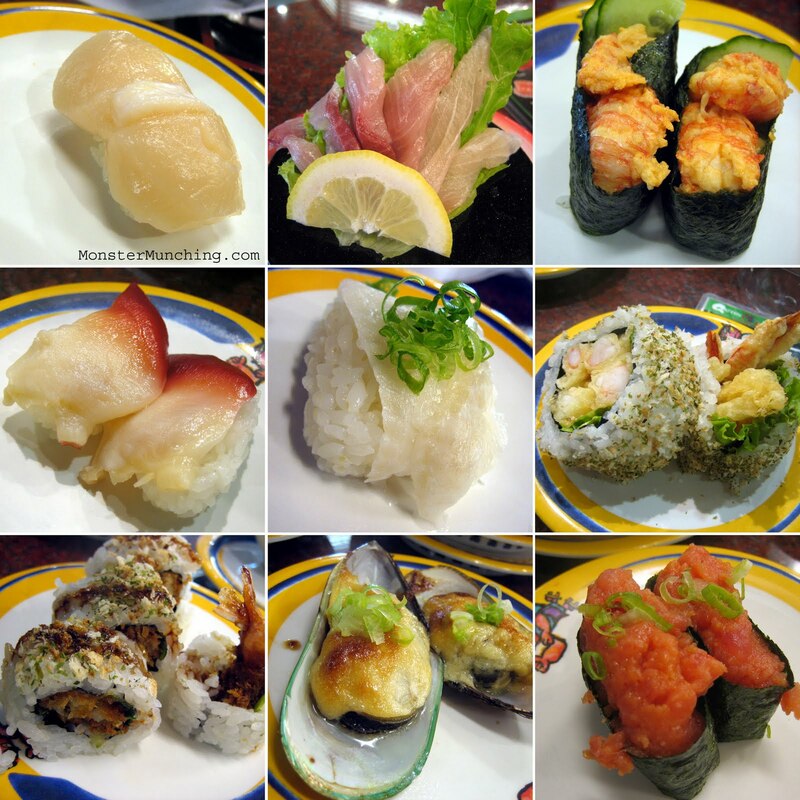 I've been debating which of the sushi conveyers to try and you just made up my mind! And I'm glad you read this! I was beginning to think no one did. Though there are always items to avoid, I was surprised how much I liked it overall. The one in Costa Mesa is much much better. The food here is merely for budget. Last time, I spotted a hair in my sushi rice. I didnt want to embarrase them so I only told the waiter in low voice. The waiter took it back, and I waited for long time, another waiter took a new plate back claimming that I put a order for it. The japanese owner only stood far away without any apology. Everyone just pretended nothing happen. This is a very bad experiece. I would never go back. I haven't tried the other two places in Irvine. But from your rank, I know I don't bother to. If you mean Kaisen, I used to love them to death (they'd actually be my number one); but there was one or two instances that brought them down a notch. One involved an incident with raw oysters that I'll leave unsaid.